Real Madrid star Ronaldo is muscled out by Austria midfielder Stefan Ilsanker - a good friend of Derry City's Lukas Schubert. STEFAN Ilsanker starred for Austria against 2016 European champions Portugal this summer and tomorrow he’ll visit Brandywell Stadium to watch a very special friend as Derry City take on Longford Town. The Austrian international midfielder helped shackle Cristiano Ronaldo during the 0-0 draw at the Parc des Princes last month and was denied a goal by a superb save from Rui Patrício. Derry City's Lukas Schubert has 'fallen in love' with his new club. He now looks forward to playing his club football in the German top flight next season having helped RB Leipzig gain promotion to the Bundesliga. Before then, however, Ilsanker, who made 130 appearances for Austrian champions, FC Red Bull Salzburg, arrives in Derry to watch his longtime friend, Lukas Schubert play for the ‘Candy Stripes’. The midfielder got up close and personal with Ronaldo as Austria qualified for the Euros for the first time, and he even managed to beat his teammates to the Real Madrid star’s signed shirt before generously giving it away to another close friend. 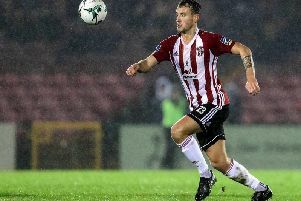 Derry midfielder, Schubert recalls how his friend regularly came to visit him in hospital when he was battling against a rare heart condition, myocarditis. I love Derry. I’ve actually fallen in love with this club and hope we can have a good second half of the season. And he’s thrilled to have his best pal and his other close friend Florian Marchl - an Austrian Olympic wrestler - attend as special guests of honour. “My friend Stefan Ilsanker is coming,” said Schubert. “He’s my best mate. We know each other since we were little boys kicking the ball during the breaks of our school lessons. “We always had big dreams and both made it professionally. So I’m lucky he’s coming to visit me. “He came into the national team during the Euro 2016 qualifiers and established himself very well. “He got 90 minutes against Portugal and the first 45 against Iceland. He played very well and I’m really proud that I can call him my friend. “I’m proud he will watch me,” he continued. “I was sick for two years and he visited me at the hospital every day when he had time off. It means so much that he’s coming here to watch me. “We’ve been through so much together. As most of his teammates watched Republic of Ireland make the last 16 of the Euros, Schubert was delighted to see his home nation do so well in a tough group which consisted of eventual winners. And it made it that extra bit special as his best friend played such a big role. “I’m proud my nation,” he beamed. “We had never qualified for the Euros and the last time we were in it was because we the country who hosted it. “The most important thing for me was my best friend played well,” he smiled. While it would be regarded as a major coup if Derry City boss, Kenny Shiels was to take advantage and convince Ilsanker to agree terms when he meets up with the squad tomorrow, Schubert reckons Derry already have a similar player within its ranks. “He reminds me of Harry Monaghan,” said Schubert. “Stefan is physically very strong and maybe the fittest player in Austria at the moment. “He’s also technically very good and you have to be to play in the German Bundesliga. “He always knew he would make it at the highest level. In school in front of everyone he said he would make it with Austria to a World Cup or to the European Cup and everyone laughed at him. But he made it a reality and showed everyone what he’s capable of. Schubert has settled in quickly at his new club since arriving on a free transfer last May. In fact the 26 year-old claims he’s ‘fallen in love’ with the Brandywell club. “I love Derry. I’ve actually fallen in love with this club and hope we can have a good second half of the season. “Hopefully we get the win against Longford. “I’m confident”.